Anemia is a condition of body, in which decrease levels of red blood cells, or hemoglobin in blood is found. As a result, body cells do not receive enough oxygen. A person with mild anemia does not show any symptoms. But, a person with severe anemia shows symptoms like pale skin, experiencing fatigue, and shortness of breath. Anemia is mainly caused due to loss of blood, when the production of red blood cells decreases, and when red blood cells get destroyed. 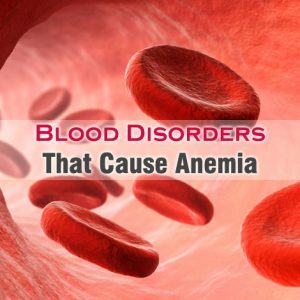 There are even some blood disorders that cause anemia. Loss of blood is the common cause of anemia. But, unless and until loss of blood is related due to impaired red blood cells production, it does not turn into iron deficiency anemia. Thalassemia is an inherited blood disorder, in which abnormal functioning of hemoglobin is observed. This results in improper transportation of oxygen in the cells, and destruction of red blood cells. Symptoms of Thalassemia observed are fussiness, pale skin, loss of appetite, frequent attack of infections, jaundice, and enlarged organs. Pernicious anemia is a blood disorder, in which body does not absorbs sufficient Vitamin B12 from diet taken. This deficiency of Vitamin B12 results in decrease of red blood cells. Common symptoms of Pernicious anemia include fatigue, pale skin, shortness of breath, numbness of hands and feet, chest pain, and a smooth red tongue. Hemolytic anemia is also one of the common blood disorders that cause anemia. Abnormal breakdown of red blood cells is observed in Hemolytic anemia, which is caused by hemolysis. Commonly observed Hemolytic anemia symptoms include shortness of breath, and fatigue. Aplastic anemia is rare blood disorder, in which sufficient red blood cells are not produced by bone marrow. Along with red blood cells, white blood cells, platelets are also not produced due to Aplastic anemia. Common observed symptoms of Aplastic anemia include fatigue, dizziness, pale skin, shortness of breath, irregular heartbeat, chest pain, headaches.